Unless you are a gambling person, betting on one horse (or in this case equity) is a terrible investment strategy. By taking your entire investment allocation to Enterprise Investment Schemes (EIS) or Seed Enterprise Investment Schemes (SEIS) and putting it into one company you are essentially guaranteeing 1 of 2 outcomes possible outcomes: success or failure. Diversification of the same investment across multiple companies mitigates your failure rate and increases your success rate. In equity investing, diversification is a way to ensure that you maintain a balanced portfolio across all sectors of the market to ensure that whichever sector is trending you can take advantage of the upswing. Conversely it limits your exposure to industries on a downswing. By buying into more than one industry and company you stand a chance to mitigate your risk, preserve more of your investment capital and hedge your portfolio. There are 2 types risk that are relevant to equity investing: Stock specific risk and systemic risk, which is the risk that the entire market falls in one go. You can reduce specific risk to virtually zero by diversifying extensively. However, the problem is that the more you diversify, the higher your costs. By investing in startup companies or other enterprises in the EIS and SEIS programs it is impossible to eliminate your risk. Diversification is especially poignant in relation to SEIS investments as statistics show more than 50% of new businesses fail within their first 5 years. Essentially if you invest all your capital into one venture, you are more likely to lose it all. However, if you invest in multiple startups you mitigate that risk by enabling the successes to make up for the losses. 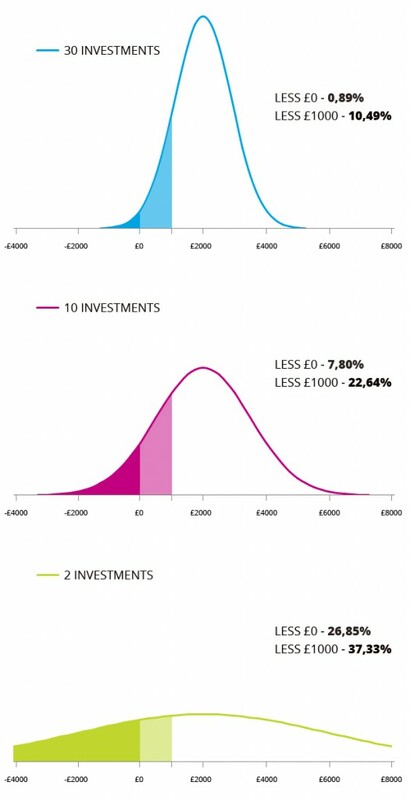 With the attractive tax benefits combined with diversification it is a no-lose proposition. Diversifying means we reduce the standard deviation, leading to a narrower distribution. This means our portfolio is less likely to fail. There are many types of risk that you are likely to encounter when investing. For example, there is the risk that the entire sector that you are investing in may run into difficulties, or that there is another banking crisis which makes it impossible to sell investments because the purchasers cannot raise debt. These risks are known as systemic risks. Systemic risks are much harder to manage. However, when building a portfolio, it is important that you diversify across investment manager, sector, funding stage. You should also look to spread your investments over time so that you gain exposure to different points in the economic cycle. Many investors enter into different schemes simply to preserve their original capital and receive the benefits of that particular investment. With EIS and SEIS you benefit already handsomely from the tax incentives, but if you can also preserve more of your capital through diversification it becomes a win-win situation. Hedging allows you to take an opposite position in a similar company or industry. If people had invested in commodities and bonds before this recent global recession, many of their portfolios would have been saved from crumbling returns. By investing in multiple industries you can ensure you ride the return-wave of trending upward cycles, off-setting losses of other industries that perform poorly. Diversification essentially narrows your range of likely return outcomes. If you invest in 1 company, there are only two outcomes. Either you lose a portion or all of your investment or make a return on your investment. You do not know the outcome before investing and so must wait to see which outcome happens. Especially with EIS and SEIS portfolios where you have to leave them invested for 3 or more years to reap their other benefits. Whereas if you took the same investment across 10 companies, your return will neither be the highest possible return of the best performing company, nor will it be the worst possible return of the worst performing company. You have narrowed the outcomes to a narrower range, allowing for an average return across all investments. Choosing a platform such as Kuber Ventures, reduces the cost of for EIS and SEIS investments and allows you to reduce your risk which, in turn, helps you increase your successes as well as diversify your portfolio across more companies, lowering your overall risk even further.